(172-174 gm) I use them for my longest drives, I carry 5 of them ranging from overstable to flippy. I also use them for forehands that need distance. Z Predator I carry 2 one stable and one a little more straight. These are my go to drivers that I trust the most, I mostly use them for hyzers or any shot that needs to finish left. Z Undertaker I carry 2 of them one goes dead straight and the other turns over a little but will still come out of it..
Z XL This is the disc I trust to turn over every time but won't flip into a roller. I rarely throw rollers but this is my roller disc. (174 gm) I carry one for spike hyzers and skip shots. I will also use it to throw grenades. 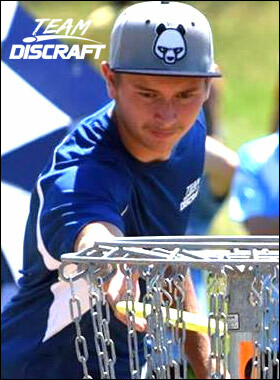 Z Buzzz I carry 4 for of them because they are the most trustworthy disc on the market. I range them from extremely flippy to stable, I try to throw a buzz whenever possible. (177 gm) I use this for my mid range hyzers because I know it will never flip and will always finish hard left. D Challenger I carry 1 Z FLX challenger for my upshots with 150 feet that are turn overs. I also carry 2 pro d challengers to putt with I love the stability to them for when it gets windy and long putts I know they will always finish left. (175 gm) This is my approach putter which has a little bit of stability to it. I use this for all of my upshots that are not turnovers within 150 feet. Leicester MA It is a beautiful course with a variety of different shots that are quite difficult. Green Lake WI This course has challenging holes in and out of the woods with elevation. Madison WI Beautiful course with long well groomed fairways to distinct greens. Milwaukee, WI Has short technical shots in the woods with a couple long open shots that are 500+ feet. Lac Du Flambeau WI A shorter but beautiful course through the woods with 2 sweet lake holes that are very friendly to spectators.